I know it’s been radio silence around here for a while, but I’m popping in to share my contribution to the For Pinks Sakes Blog Hop that I’m participating in, hosted by my friend and DCMQG Secretary Anna at Life Sew Crafty. Anna’s family is one of many who have been affected by breast cancer. Specifically her mother-in-law’s fight inspired this blog hop to raise awareness about breast cancer and to create quilts for donation. Did you know that According to the Wold Health Organization breast cancer is the most common cancer among women world wide? One in eight women will be diagnosed with breast cancer in their lifetime. As part of the blog hop Anna has asked that we create a block to be included in a quilt she is making to donate to the Lemmen-Holton Cancer Pavilion in Grand Rapids, MI where her mother-in-law was treated. 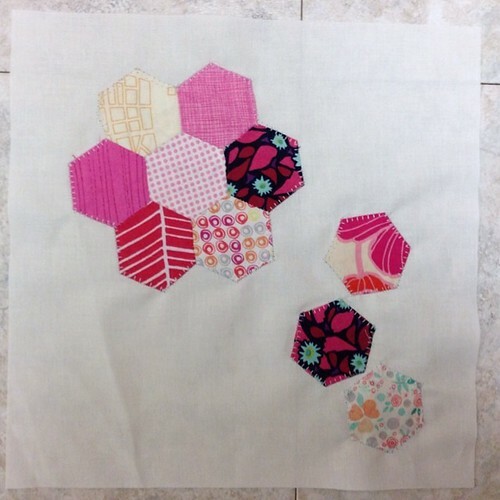 My block is made from some of my hexies that I worked on during my initial recovery from my shoulder surgery. I hand sewed the flower together and then starched it well before removing the papers. I machine appliquéd the hexagons on using a light gray Aurifil thread and then trimmed the block to 10.5″ square. If you would like to contribute a block, you can read the specifications on Anna’s blog. The short version is any size block that reads pink and is larger than 4″ is fine. There’s an additional incentive if you participate – Anna will be hosting a giveaway on August 2nd. There will be lots of ways to win so be sure to watch out for that. You can see everyone else’s contributions to the blog hop using the links below. I love your quilt block! I’ve got a few hexies that would be perfect for this. I like the modern look you’ve given them. Love the hexies! Thanks for participating.